I testified before the House Ways & Means Committee earlier today. As always, my trip inside the belly of the beast was an interesting adventure. The tax-writing committee was holding a hearing on the value-added tax. I was on a panel with five other witnesses, and all of the other people testifying were sympathetic to a VAT. But since I had truth on my side, that made it a fair fight (though it did cross my mind that it’s not a good sign when a Republican-controlled committee stacks the witnesses in favor of a European-style tax system). I made two points. First, a VAT is less destructive than the current income tax. As such, if we somehow repealed the 16th Amendment and replaced it with something ironclad that would prevent the income tax from ever again haunting the land, I would gladly make a trade. But that’s not going to happen, so my second point was to warn that the VAT would be a recipe for bigger government. And even though some of my fellow witnesses said the revenue could be used to reduce deficits, I pointed out that Europe adopted VATs beginning in the 1960s and that hasn’t stopped welfare states such as Greece and Portugal from spending themselves into a fiscal crisis. This chart, which is similar to what I included in my testimony, compares spending and debt levels in EU-15 nations (Western Europe) and the United States. 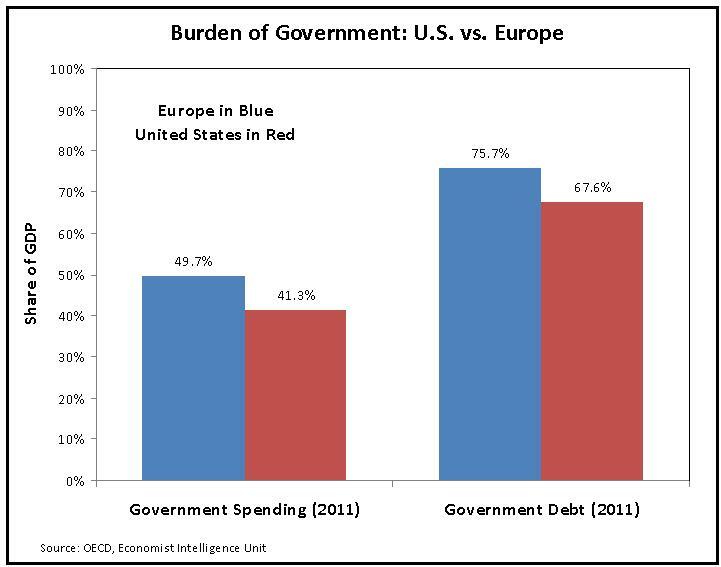 As you can see, the burden of spending and debt is onerous in America (red columns), but even worse in Europe (blue columns). I made some of these points in my VAT video. P.S. Here are three very good cartoons on the VAT (here, here, and here). Taxes, not only VAT, but all taxes are people’s money. It’s not govt’s birthright! So govt should be careful not to think it as their property or right, to be taken as much and as when they deem right. Taxes should be minimal to fulfill minimum objectives not attainable by individual, and thereby benefiting the individual as well as the nation. Again, taxes are not privilege or right of govt., but it is people’s money meant for them, to support them in ways they cannot do themselves; not take it away from them to give them away to other people. It is state-mediated plain theft. If I make a mistake,… IS IT REVERSIBLE? A nation can, to some extent, afford to play around with various dubious ideas so long as they can be reversed. VAT is definitively NOT in that category. I know of no country that has retreated from VAT. As a matter of fact, once the tax is instituted, you’d be hard pressed to find instances of VAT rates merely being decreased. Once instituted, the tax will only go up and up and up, until it becomes obvious that you are on the other side of the Laffer Curve. But, by then, it’ll be too late, as you would irreversibly be on the 1.5% growth point of the Rahn Curve. A point of mathematically certain economic extinction in a world riding a 4-5% growth trendline. More importantly, as historical evidence shows, this high tax, low growth situation would be IRREVERSIBLE. If you keep playing around with pernicious irreversible ideas they will all stick sooner or later. Its something like entropy. It cannot be reversed. Of course Republicans have to toe the line between the ideology they supposedly espouse and advertise, and their intrinsic interest as politicians, who will predictably gain power, fame and fortune by becoming the gatekeepers and allocators of wealth. But wealth must be first gathered in a central location to be managed by politicians. VAT is the ideal vehicle for that. I do not expect Republicans to resist the temptation. Most politicians — Republicans included even though less overtly — would much rather live in a world where there is less wealth which they can manage, than a world with more wealth but beyond their immediate control. But political allocation of wealth, whether done by Legislator, Politician, or Ballot Box, inevitably leads to lower overall wealth. In a finite life, people will simply not spend time and energy away from their friends and families to go to work to benefit some distant unknowns. And collective management of the economy must inevitably be more homogenizing and uniform, so it will predictably miss the surprising areas form where true innovation will emerge. Because innovation that is predictable, is no innovation, almost by definition. Little by little, the public will be persuaded to acquiesce to a first very modest imposition of VAT. That will be the end of it. From that point on, expect VAT and overall taxation to only increase. In spite of their rhetoric, many more politicians than they admit, have probably already figured out that there just isn’t nearly enough wealth that can be harvested from the rich to pay for the massive entitlement programs that are on autopilot to bring America to a competitiveness dead end. In what is probably the biggest banana peel Americans ever stepped on, the American electorate not only failed to address existing entitlement programs, but also voted for a government that instituted the third pillar of American decline, the one with the most pernicious disincentives to production and invitation to indolence, called, ObamaCare. And all that in the middle of a recession and impending slide into decline. What more proof of what Mr. Mitchell modestly calls the Mitchell principle (or is it Mitchell Law?). So, the American middle class essentially dug its own grave, in the same classic way that Europeans dug their own graves. Now, the very middle and lower class will be drafted into taxation as the middle and lower class must be inevitably tapped to pay for their own benefits – except now with bureaucracies acting as the pimp intermediaries and the great motivation to produce when half your day’s effort goes to a communal pool while the mediocre benefits provided by the pool are available regardless of how hard, smart, or innovatively you work. I agree with you. The revenue increase would not be used to reduce the deficit and overall debt. A pile of money that politicians could get their hands on? Oh, I think we all know how that would work out and it certainly wouldn’t be to pay down past debts. It is like giving someone nearly bankrupt with credit card debt another credit card! We need fewer taxes, not more!